The sun rises over the fields, the landscape seems to Vietnam. At our side comes and goes the Guadalquivir. Rio that we will continue to its delta. At about 50 km from Seville we made our first stop for breakfast. The place looks the old west. The perfect place for a duel of Sergio Leone film. On the bark of a nearby tree we come back to see our names written, the last time we went through there. For a few kilometres a ship us. It’s man against machine. Have you ever been curious to know how it would be embark on a boat and leave it all behind?. Maybe worth just to see at least once the stars on the ocean, so far from anywhere, so close to yourself. The landscape is increasingly inhospitable and melts. Start making lots of heat. We want to eat and the only bar in miles around is closed. A hard blow because we have no water. But we must continue. About 10 km we came across a bar in the middle of nowhere, like an oasis. We make sure that is real and eat, rest a little and continue. 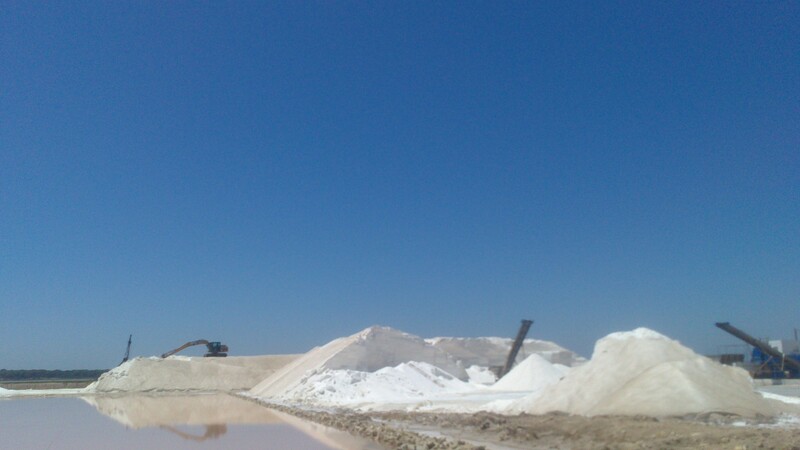 We see the salt, a sure sign that we were close to Sanlucar de Barrameda. 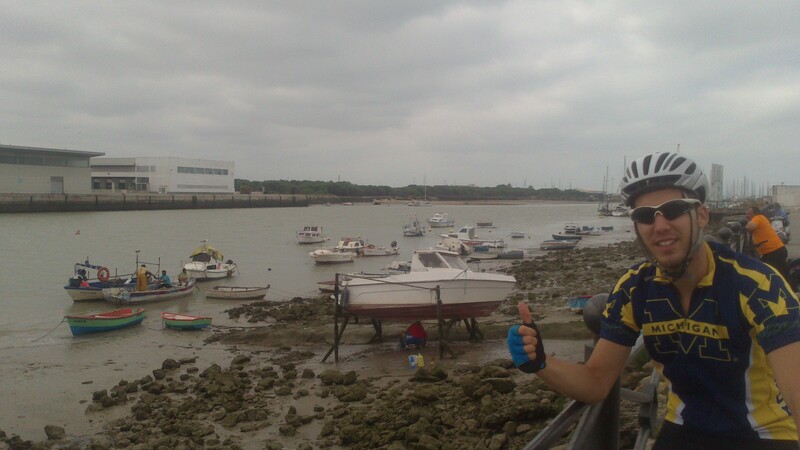 We arrived at the beach of Sanlucar de Barrameda, where we rest before continuing our march to Chipiona. I feel good, so I decide to test strength, swimming about 2 km along the coast. For an old railway path that crossed Chipiona up to Costa Ballena, where we made our first night. Ending the day with a 130 km cycling and a bit of swimming. Hard breakfast. A great snack. We begin our second phase, we left Costa Ballena, we plan to spend the night in Conil de la Frontera. 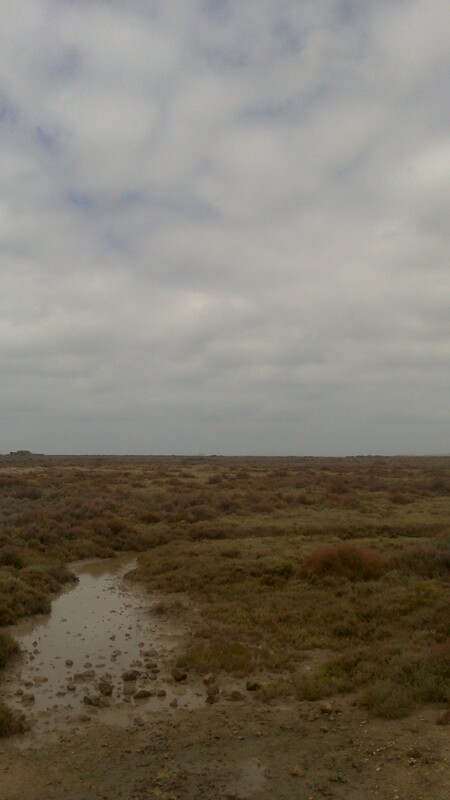 Walking about 115 km away. Good news!, the day is cloudy, we know that the heat is not as oppressive and hopefully can get up some breeze. After surrounding the military base in Rota, we cross a highway under construction that leads to El Puerto de Santa María. Birthplace of the poet Rafael Alberti. We left the port of Santa Maria and throughout the metropolitan park The Toruños and Pinar de La Algaida, we headed to Puerto Real, Cadiz City with our right, on the horizon. Already in Puerto Real eat and we replace forces under a tree, avoiding the hottest hours of the day. 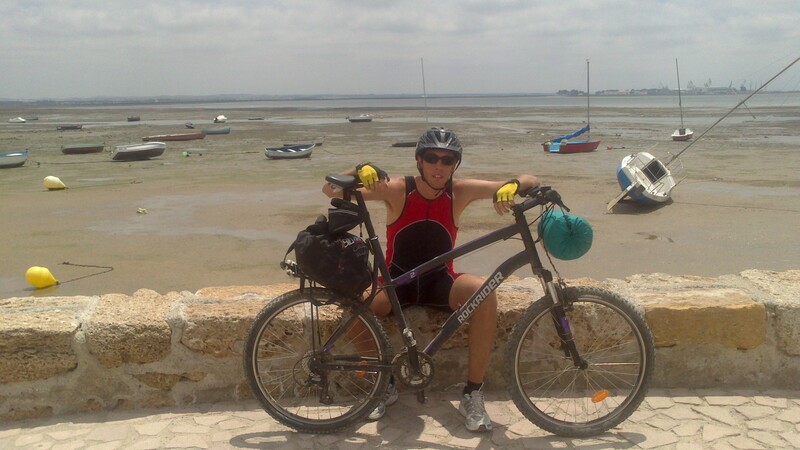 We left Puerto Real to surround the bay of San Fernando, Chiclana direction. At the beginning of the road there was a sign that caught our eye, in announcing the investment of nearly two million euros for the conservation of that road. That money should be spent on snacks and beer to ghost workers. We arrive to Chiclana, where we surprised a monument of a cyclist. What irony!, Minutes later would know how little respect that people had towards cyclists. People behaved as if they were under the influence of cocaine! no joke, too fast! too fast!. Best thing about this town?, Some friends I met on a cruise, especially a girl with a fascinating personality, love of London, the Irish Pubs, Oasis and the soliloquies of Hamlet. 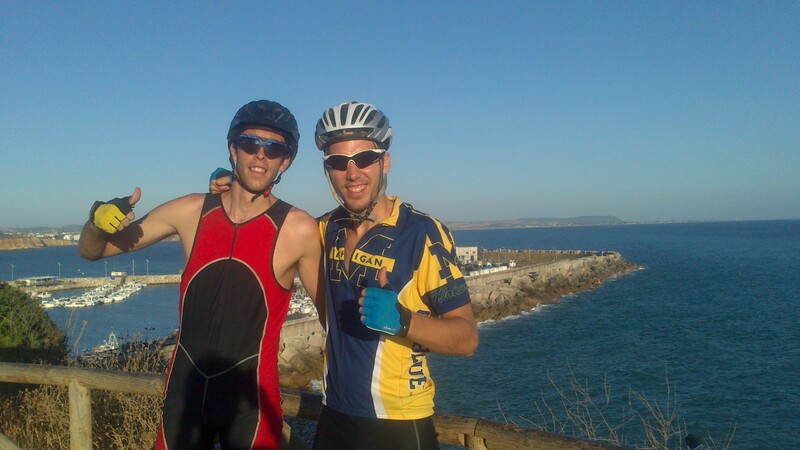 Sancti Petri is crossed to the port of Conil and arrived at the lighthouse, a few miles our stage ends. Now we just have to find a place to sleep. After wandering around the streets of Conil, we move along the beach to cross the river to reach Conilete abandoned bunker in the middle of the night. Halfway there, we met a guy with a flashlight in the head. Apparently was a photographer and was passionate about taking pictures at dawn. We put the bikes and a side bunker we safeguard us from the cold. As I fell asleep listening to the wind, I imagined the voice of a soldier inside that bunker, in a round of night over 60 years ago, then fell into a deep sleep. We wake up, leave the bunker. We have punch and although parts, we prefer to have more cameras. 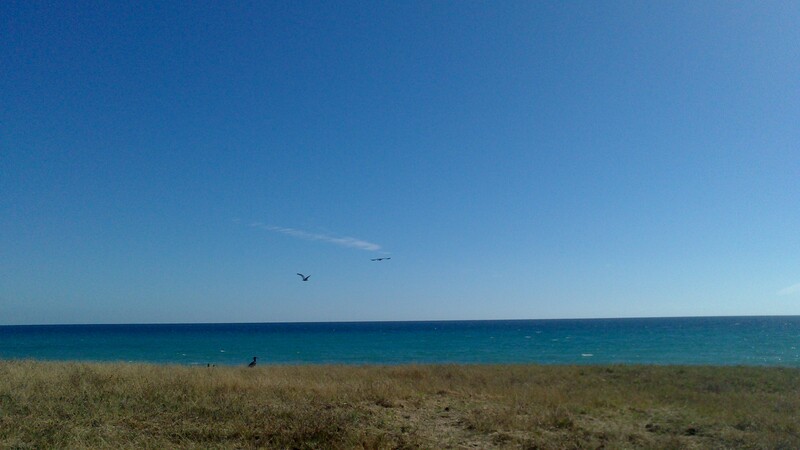 So back to Conil. Breakfast good toasted with ham, tomato and olive oil and orange juice. 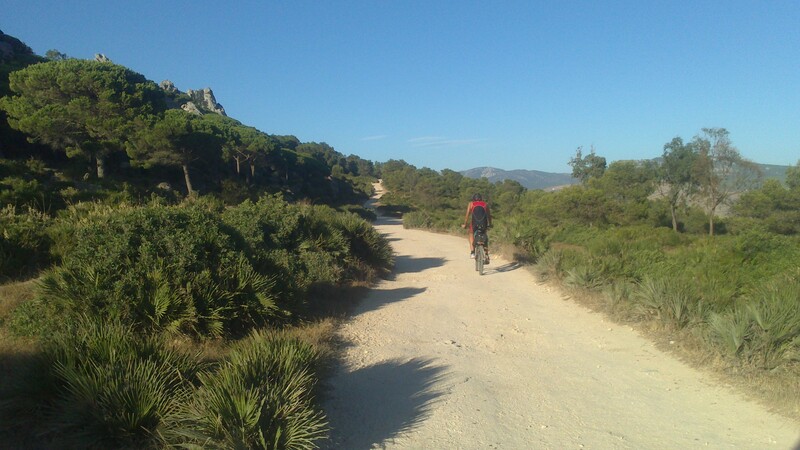 Crossed “the Caños de Meca” to get into the Natural Park “La Breña”, descending down to Barbate. A few kilometers we came to “Zahara De Los atunes”. 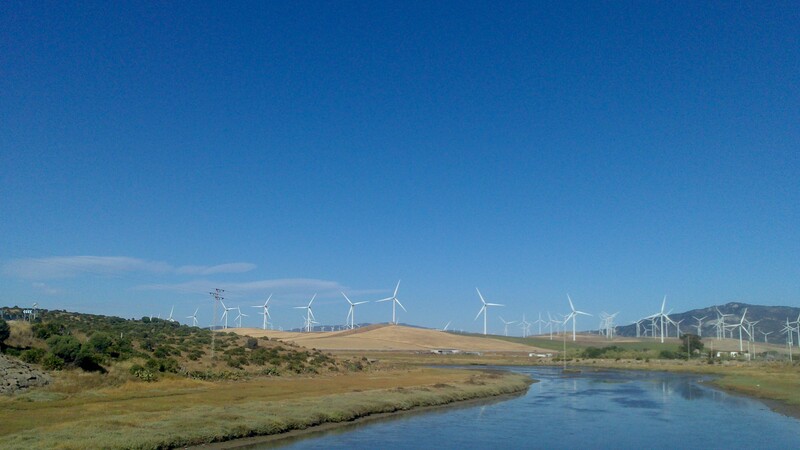 Where we are faced with dozens of mills, as in the great work of world literature, Don Quixote by Miguel de Cervantes. After reaching the end of the urbanization of Zahara, climb a rocky road, and later descend to reach Baelo Claudia, a Roman market town built possibly on a Phoenician settlement. The landscape in this part is beautiful. We leave Baelo Claudia to climb one last mountain, we know that price should not be far behind. But it starts to get dark, and the desire to get us to avoid the path pointed out and choose to go down the road as quickly as possible. We never imagined it would come to Tarifa running, about 5 miles from our goal, punctured, so we decided to run towards the lights of the city, through a field adjacent to the road. Contemplating Africa at night is fascinating, is like going back millions of years and get under the skin of those who under the stars, eager to reach the other shore, illuminated by the moon. Waking up and seeing Africa is almost a dream, a goal for us, that we have reached effort. Looking at the strait is impossible to think of people dying so often for being here, on the other hand, in Europe. So far from their homes and families. While there are those who are here and are spending their lives through a screen. From here we show our sincere admiration for those who are emboldened against the wind and tide take to the sea. They are the roots of human, selfish, forgot his roots. We said goodbye to Africa, thought to rest one day but finally we decided to continue our march. After a bath early, continue. From the moment our phones start running out of battery. We moved away from Tarifa, Claudia Baelo crossed to reach Zahara, to later turn to Barbate. We set off early Chiclana. Where desayunamos.Y headed to Puerto Real, through the natural park of Los Toruños and pinewood of Algaida arrived the town of El Puerto de Santa Maria, where we eat while enjoying the air conditioning before you continue since it is noon and makes more than 35 degrees. 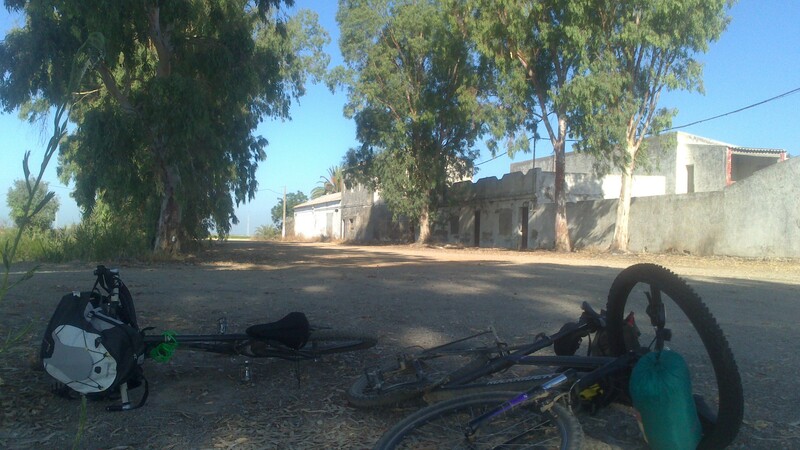 It is hot but we decided to continue, on the outskirts of El Puerto de Santa Maria we stop to drink water. So begins a conversation with six policemen, all in front. We arrived at Sanlucar de Barrameda , is half past eight . Nightfall . And we want to cross the delta to travel more than 30 miles of beach. No food, no water , continue . Our phones have battery left hours ago, so we can not make any more pictures. Anyway there is no better way to appreciate what with your own eyes . What about the money ? we had no more than cents , although we would serve little money in the place where we were going . We took the last boat leaves at the other side, in the middle of the journey we tell the boatman who do not have money to pay the tickets , yet access lead , but warns us not to see us the other side guards . But bad luck on the other side waiting for a couple of forest guards. 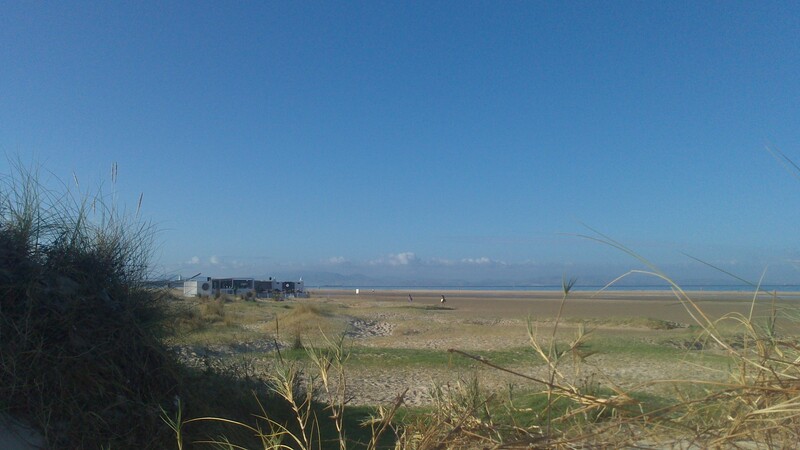 We said we were going to go the beach to Matalascañas , we knew camping could not finally agree to let us pass . The guards get on the boat and started walking on the beach. Suddenly we begin to see that we are in a paradise. Families of boars roam along the shore. Hundreds of birds are raised to the flight in a golden sunset , more orange. The beauty of the place overwhelms us , but slowly rising extremely humid winds against us and it is very difficult to pedal. The tide is high, so we walked . We started to cool off , moisture is destroying us lungs with air cleaner we have ever breathed . How ironic . The night is upon us and the only lights we see come from where we come from and the place where we are going , there is no moon , but we use the reflection on the shore of the lights on the horizon. We are surprised to see how the eyes adapt to the dark extreme , and still get to see some of the beach and dunes . About us more starry heaven which we have looked ever, absolutely stunning . We use the sleeping bags to cover our chest and take away some of the moisture that brings the wind . We ride at times, on our way from time to time we see boars away from the shore. We saw dozens of them for hours. 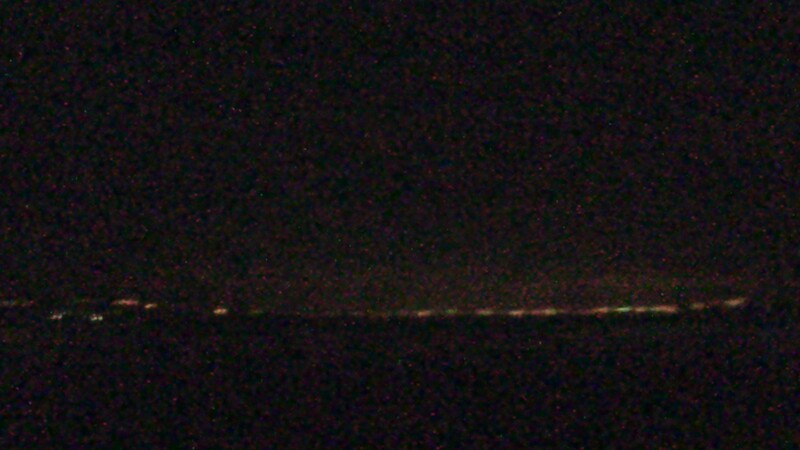 Pedaled toward the lights of the horizon, our progress is imperceptible in the middle of almost total darkness . It was like pedaling nowhere, and produces a slight dizziness , you get used to it . After four hours walking at times and other times on the bike , we began to see in the distance the first buildings . Although we still have a few miles we know we’ve arrived and that encourages us to go faster despite the accumulated fatigue . From darkness we encounter fishermen on the beach , none greets us . Arrived! , Are almost three in the morning. 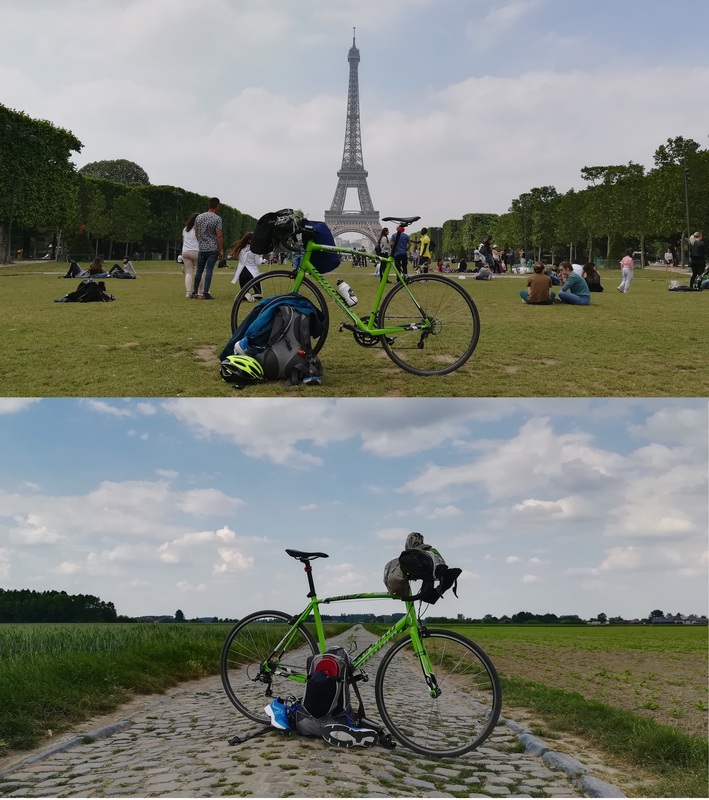 Gone is a journey of nearly 600 kilometres along three provinces , Seville , Cadiz and Huelva , 4 punctures , roads, highways , beaches, mountains and people we spoke to , who all showed their admiration and support. Perhaps no company of Julio this trip would not have been possible, as it is increasingly difficult to find people who are willing to escape from their lives , away from a television, computer or mobile screen . Preferring the comfort and security of being at home , and throw their money on drinking every weekend . Sport is an escape , but also a great way to know yourself . From here we encourage you to make your life a great story to tell . Because your life is all you have and that’s all you need . Because freedom is useless if you can not share it, because dreams do not exist, there is the effort to achieve them. Next challenge! Apenas son las 8 de la mañana. Lejos del ruido, lejos del humo de los coches. La ciudad ya despierta a nuestra espalda. El sol ya se levanta sobre los arrozales, el paisaje parece Vietnam. A nuestro lado viene y va el Guadalquivir, serpenteante. Rio que seguiremos hasta su delta. A unos 50 km de Sevilla hacemos nuestra primera parada para desayunar. El lugar parece el viejo oeste. El lugar perfecto para un duelo de una película de Sergio Leone. Sobre la corteza de un árbol cercano volvemos a ver escritos nuestros nombres, de la última vez que pasamos por allí. Durante unos kilómetros nos acompaña un buque. Es el hombre contra la máquina. ¿Nunca has sentido curiosidad por saber como sería embarcarse en un barco y dejarlo todo atrás?. Tal vez merezca la pena solo por contemplar al menos una vez las estrellas en mitad del océano, tan lejos de cualquier parte y tan cerca de ti mismo. El paisaje es cada vez más inhóspito y se deshace. Comienza a hacer mucha calor. Queremos comer y el único bar que hay en kilómetros a la redonda está cerrado. Un duro golpe, pues tampoco nos queda agua. Pero debemos continuar. A unos 10 km nos topamos con un bar en mitad de la nada, como un oasis. Nos aseguramos de que es real y comemos, descansamos un poco y continuamos. 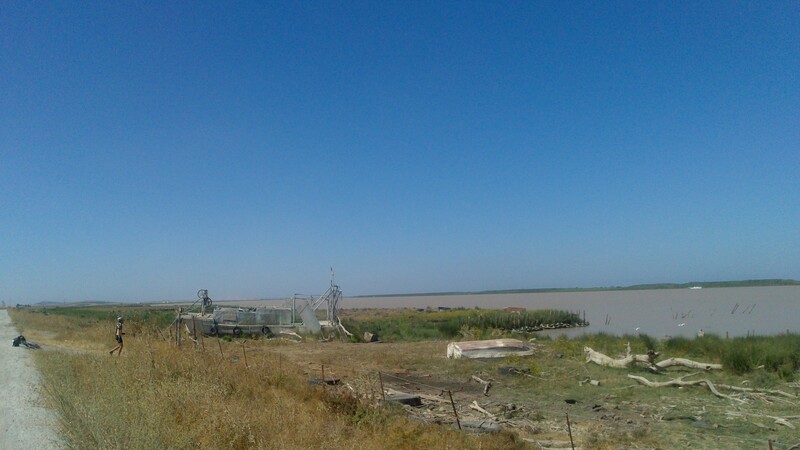 Ya vemos las salinas, señal inequívoca de que estábamos muy cerca de Sanlúcar de Barrameda. Llegamos a la playa de Sanlúcar de Barrameda, donde descansamos antes de seguir nuestra marcha hacia Chipiona. Me encuentro bien, así que decido probar fuerzas, nadando unos 2 km por la costa. Por un antiguo camino de ferrocarril cruzamos Chipiona hasta llegar a Costa Ballena, donde hacemos nuestra primera noche. Acabando el día con unos 130 km en bicicleta y un poco de natación. Desayunamos duro. Un buen bocadillo. Comenzamos nuestra segunda etapa, salimos de Costa Ballena, tenemos previsto hacer noche en Conil de la Frontera. Recorriendo unos 115 km aproximadamente. 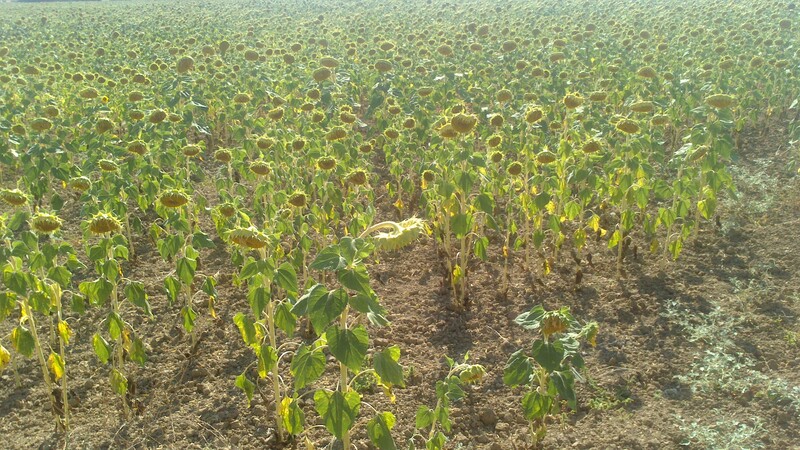 ¡Buenas noticias!, el día está nublado, sabemos que el calor no será tan sofocante y con suerte puede que se levante algo de brisa. Tras rodear la base militar de Rota, recorremos una autopista en obras que nos lleva hasta El Puerto de Santa María. Lugar donde nació el poeta Rafael Alberti. Dejamos atrás El puerto de Santa María y a través del parque metropolitano Los Toruños y el Pinar de La Algaida, nos dirigimos a Puerto Real, con la ciudad de Cádiz a nuestra derecha, en el horizonte. Ya en Puerto Real comemos y reponemos fuerzas bajo un árbol, evitando así las horas de máximo calor del día. 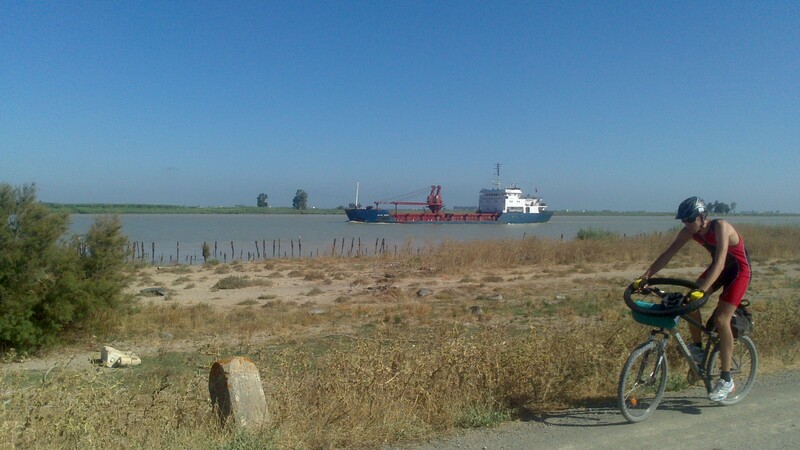 Dejamos atrás Puerto Real para rodear la bahía de San Fernando, dirección a Chiclana. Al inicio del camino había un cartel que llamó nuestra atención, en el se anunciaba la inversión de casi dos millones de euros para la conservación de aquel camino. Aquel dinero debió gastarse en bocadillos y cervezas para obreros fantasmas. Llegamos a chiclana, donde nos sorprende un monumento de un ciclista. ¡Que ironía!, minutos después conoceríamos el poco respeto que tenía aquel pueblo hacia los ciclistas. ¡La gente conducía como si estuvieran bajo los efectos de la cocaína! no es broma, ¡mucha prisa!, ¡mucha prisa!. ¿Lo mejor de aquel pueblo?, unos amigos que conocí en un crucero, en especial una chica con una personalidad fascinante, enamorada de Londres, los Irish Pubs, Oasis y los soliloquios de Hamlet. Cruzamos Sancti Petri hacia el puerto de Conil y llegamos al faro, a unos kilómetros finaliza nuestra etapa. Ahora solo queda encontrar un lugar donde dormir. Tras pasear por las calles de Conil, nos alejamos por la playa hasta cruzar el río Conilete hasta llegar a un bunker abandonado en mitad de la noche. A mitad de camino, nos topamos con un tipo con una linterna en la cabeza. Al parecer era fotógrafo y le apasionaba hacer fotos de madrugada. Colocamos las bicis y a un lado del búnker nos resguardamos del frío. Mientras me dormía escuchando el viento, imaginaba oír la voz de un soldado dentro de aquel búnker, en una ronda de noche hace más de 60 años, luego caí en un sueño profundo. Despertamos, abandonamos el búnker. Hemos pinchado y aunque tenemos repuesto, preferimos tener más cámaras. Así que volvemos a Conil. Desayunamos una buena tostada con jamón, tomate y aceite y un zumo de naranja. Cruzamos los Caños de Meca para adentrarnos en el Parque Natural La Breña, descendiendo hasta llegar a Barbate. A unos kilómetros llegamos a Zahara De Los Atunes. Donde nos encontramos ante decenas de molinos, como en la gran obra de la literatura universal, El Quijote, de Miguel de Cervantes. Tras llegar al final de la urbanizacion de Atlanterra, ascendemos por un camino pedregoso, para más tarde descender hasta llegar a Baelo Claudia, una ciudad comercial romana construida posiblemente sobre un asentamiento fenicio. El paisaje en esta parte es precioso. Dejamos atrás Baelo Claudia para ascender una última montaña, sabemos que Tarifa no debe estar muy lejos. 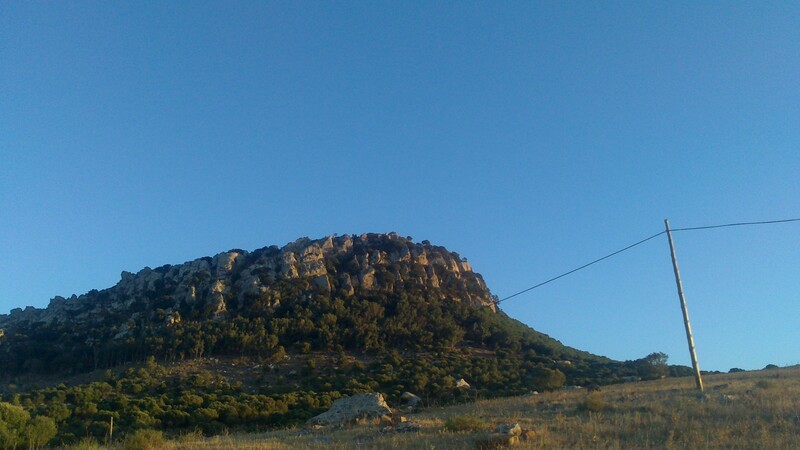 Pero comienza a anochecer, y las ganas de llegar nos lleva a evitar el camino señalado y optar por ir por la carretera lo más rápido posible. Nunca imaginamos que llegaríamos a Tarifa corriendo, a unos 5 km de nuestra meta, pinchamos, así que decidimos correr hacia las luces de la ciudad, a través de un campo colindante a la carretera. Contemplar África por la noche, es fascinante, es como retroceder millones de años y ponerse bajo la piel de aquellos que bajo las estrellas, ansiaban alcanzar la otra orilla, iluminada por la luna. Despertarse y ver África es casi un sueño, para nosotros una meta, que con esfuerzo hemos alcanzado. Al contemplar el estrecho es inevitable pensar en la gente que muere tan a menudo por estar aquí, al otro lado, en Europa. Tan lejos de sus casas y sus familias. Mientras hay quienes están aquí y ven pasar sus vidas a través de una pantalla. Desde aquí mostramos nuestra más sincera admiración a quienes se arman de valor y contra el viento y la marea se lanzan a la mar. Ellos son las raíces del ser humano, que egoísta, olvidó de donde viene. Nos despedimos de África, pensábamos descansar un día pero finalmente decidimos continuar nuestra marcha. Tras un baño bien temprano, continuamos. A partir de este momento nuestros móviles comienzan a quedarse sin batería. Nos alejamos de Tarifa, cruzamos Baelo Claudia hasta llegar a Zahara, para mas tarde dirigirnos a Barbate. Volvemos a adentrarnos por el Parque Natural de La Breña, donde aumentamos nuestro ritmo dirección El Palmar. Encontramos un sitio resguardado del viento en la playa de Conil, y allí pasamos la noche. Partimos temprano hacia Chiclana. Donde desayunamos.Y nos dirigimos a Puerto Real, a través del parque natural de Los Toruños y el pinar de la Algaida llegamos la localidad de El Puerto de Santa María, donde comemos mientras disfrutamos del aire acondicionado antes continuar, pues es medio día y hace más de 35 grados. Hace mucha calor pero decidimos continuar, a las afueras de El Puerto de Santa María nos detenemos para beber agua. Entonces comienza una conversación con seis policías, todos en frente. Llegamos a Sanlúcar de Barrameda, son las las ocho y media. Anochece. Y queremos cruzar el delta para recorrer más de 30 kilómetros de playa. Sin comida, sin agua, continuamos. Nuestros móviles dejaron de tener batería hace horas, así que no podemos hacer ninguna foto más. De todas formas no hay mejor manera de apreciar aquello que con tus propios ojos. ¿Y el dinero? no nos quedaba más que céntimos, aunque de poco nos iba a servir el dinero en el lugar hacia donde nos dirigíamos. Tomamos el último barco que zarpa a la otra orilla, en mitad del trayecto le decimos al barquero que no tenemos dinero para pagar los tickets, aún así accede a llevarnos, pero nos advierte que no deben vernos los guardas al otro lado. Pero mala suerte, en la otra orilla esperan un par de guardas forestales. Les dijimos que íbamos a recorrer la playa hasta Matalascañas, que sabíamos que no se podía acampar, finalmente acceden a dejarnos pasar. Los guardas se suben al barco y comenzamos a caminar por la playa. De repente comenzamos a ver que estamos en un lugar paradisíaco. Familias de jabalíes corretean por la orilla. Cientos de aves se alzan al vuelo en un atardecer dorado, cada vez más naranja. La belleza de aquel lugar nos abruma, pero poco a poco va levantándose un viento extremadamente húmedo contra nosotros y es muy difícil pedalear. La marea está alta, así que caminamos. Comenzamos a enfriarnos, la humedad nos está destrozando los pulmones con el aire más limpio que jamás hemos respirado. Que ironía. La noche cae sobre nosotros y las únicas luces que vemos provienen del lugar de donde venimos y del lugar hacia donde vamos, no hay luna, aunque nos servimos del reflejo en la orilla de las luces del horizonte. Nos sorprende ver como los ojos se adaptan a la oscuridad extrema, y aun así conseguimos ver algo de la playa y las dunas. Sobre nosotros el cielo más estrellado que hemos contemplado nunca, absolutamente impresionante. Nos servimos de los sacos de dormir para cubrirnos el pecho y quitarnos un poco de la humedad que trae el viento. Pedaleamos por momentos, en nuestro camino cada cierto tiempo vemos como algunos jabalíes se alejan de la orilla. Vimos decenas de ellos durante horas. Pedaleamos hacia las luces del horizonte, nuestro avance es imperceptible en mitad de una oscuridad casi absoluta. Era como pedalear en la nada, y produce un leve mareo, al que acabas acostumbrándote. 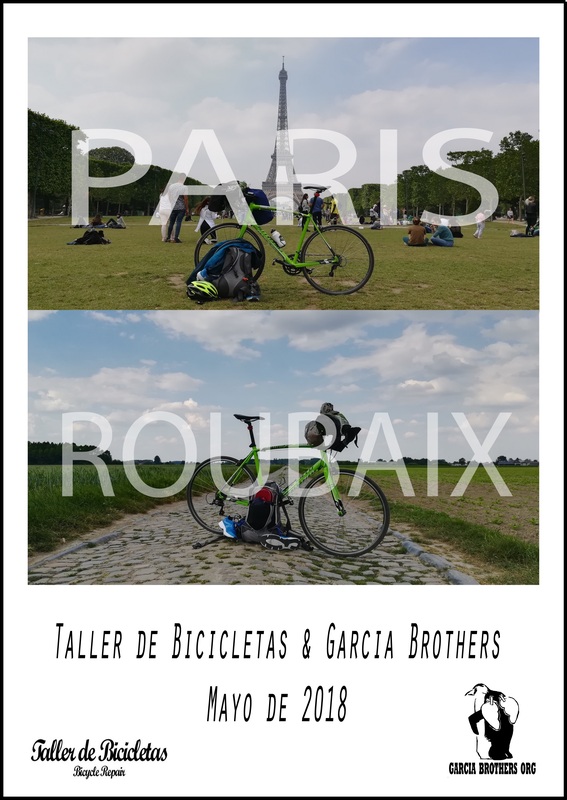 Tras cuatro horas a ratos caminando y otras veces sobre la bici, comenzamos a ver a lo lejos los primeros edificios. Aunque aún nos queda unos kilómetros sabemos que ya hemos llegado y eso nos anima a ir más rápido a pesar del cansancio acumulado. De la oscuridad nos vamos encontrando pescadores en la playa, ninguno nos saluda. ¡¡Llegamos! !, son las casi las tres de la madrugada. Atrás queda un viaje de casi 600 km a lo largo de tres provincias, Sevilla, Cádiz y Huelva, 4 pinchazos, caminos, carreteras, playas, montañas y las personas con las que hablamos, que todas nos mostraron su admiración y apoyo. Tal vez sin la compañía de Julio este viaje no hubiera sido posible, pues cada vez es más difícil encontrar a gente que esté dispuesta a evadirse de sus vidas, lejos de un televisor, un ordenador o una pantalla de móvil. Prefiriendo el confort y la seguridad de estar en casa, y tirar su dinero en beber cada fin de semana. El deporte es una forma de evasión, pero también una gran forma de conocerte a ti mismo. Desde aquí te animamos a que hagas de tu vida una gran historia que contar. Porque tu vida es lo único que tienes y eso es todo lo que necesitas. Porque de nada sirve la libertad si no puedes compartirla, porque los sueños no existen, existe el esfuerzo por hacerlos realidad. Próximo reto!